Architect's comment: Rock Cottage is in the centre of a lovely rural village near Bristol and as such the project was subject to a number of restrictive designations, namely A.O.N.B., Green Belt and Conservation Area protection. The property had also been previously extended post 1948 and as such had used up some of it's volume allowance. Steven and Sue were clear about their need for additional space and remained open minded to the various design options suggested to them to achieve this. 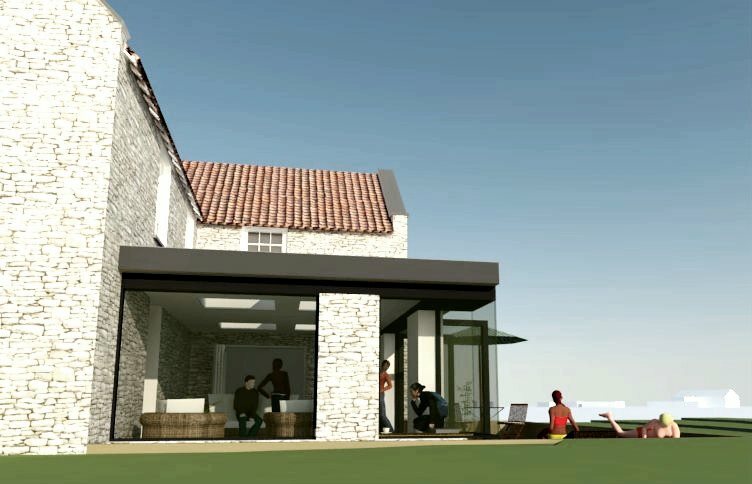 The design evolved from a combination of wishlist items, pre-application feedback from the Planning Authorities (BANES) and a sensitive aesthetic treatment which referenced the local vernacular whist maintaining a strong contemporary feel. Steven and Sue were fantastic to work with, both patient and responsive to the feedback and development of the design and planning process. "Mike was a joy to work with. His knowledge and experience was second to none - providing valuable help with the design, planning and building phase of our espresso bar in Budapest. He managed to navigate us through the Hungarian planning process seamlessly. Mike prepared thoroughly for each meeting, providing architectural blue prints, 3D graphic images and extensive site analysis documentation. The planning department were extremely impressed, and granted us permission within a matter of weeks. They even commented that they “wished every application was as detailed”. "On a personal note - Mike brought our project to life for us. Nothing was too much trouble, and we had complete flexibility to make changes and ensure we were happy with the design. Mike FitzGerald is a great guy to work with - conscientious, professional and knowledgeable - plus down to earth and witty. A wonderful combination." Architect's comment: Dave and Corrine were an absolute gift for an architect. They have vision, enthusiasm and energy together with a pragmatic attitude to construction and to the necessary bureaucracy that accompanies it. Very good fun to work with and creative to the extent whereby a design solution was realised jointly through conversation and digital image sharing. I wish them both and The Goat Herder Espresso Bar every success for the future and look forward to the best flat white in Budapest the next time I visit. Mike. I have known Mike for over 25 years. We met when I was teaching at Hull School of Architecture and Mike was one of my first year students. He was a talented and enthusiastic student, and we became friends and have remained in touch. In 2009 I was able to introduce Mike to Cardiff University, to support me initially in my role as part time first year degree tutor when I had some clashing dates. He quickly went on to become a design tutor in his own right. Mike has excellent experience in practice. He has had a senior role at Nash Partnership in Bath and I know that from his continuing consultancy work that he was considered a valued member of staff. He was also in practice in the Channel Islands for a number of years where he was invited to work principally on a large social housing scheme. Mike has also had the enviable experience of designing and actually building his own house. The lessons that this gives in both technology and project management, are great tools to share with students. As well as the obvious fulfilment of seeing a design fully realised. When working together last term I found Mike to have the qualities of a natural teacher. He “got it “from the start and it was like working with an experienced, yet fresh colleague. Mike related very well with the students, and was prepared to go the extra yard in preparation and following the progress of their projects. He was very clear and authoritative in group sessions and gave incisive and concise advice in the crits. He also had an instinctive aptitude to the marking. As a long term friend I can confirm that Mike is honest and reliable, and will not let any one down. He is good company and pleasure to spend time with. Mike has all the skills required, including that unquantifiable skill of the natural teacher.